The most celebrated dining event in the summer kicks off July 31. 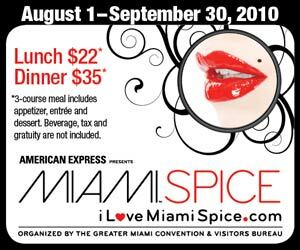 It's Miami Spice where you can indulge in the finest cuisine prepared by world-renowned chefs at Miami's top restaurants and prices are recession-friendly. It's an epicurean delight in tropical paradise. Click here for more information. Click here for participating restuarants.